The Observation Deck, 50 feet above the ground, gives guests a grand view of the canopy and beyond. 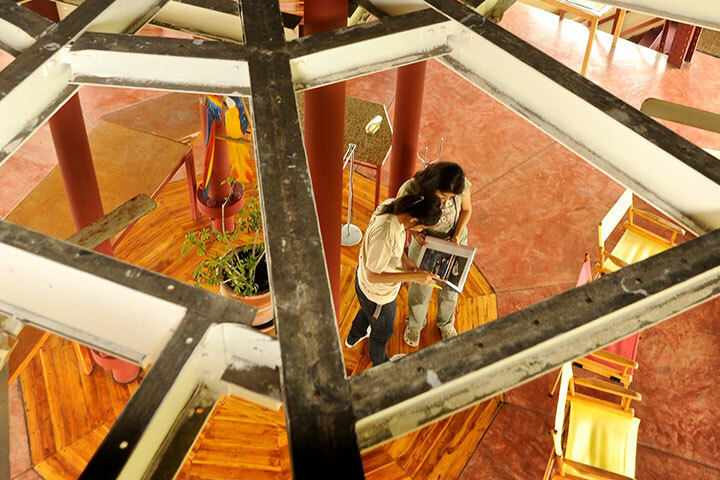 Many of the best photographs are taken from the Observation deck. 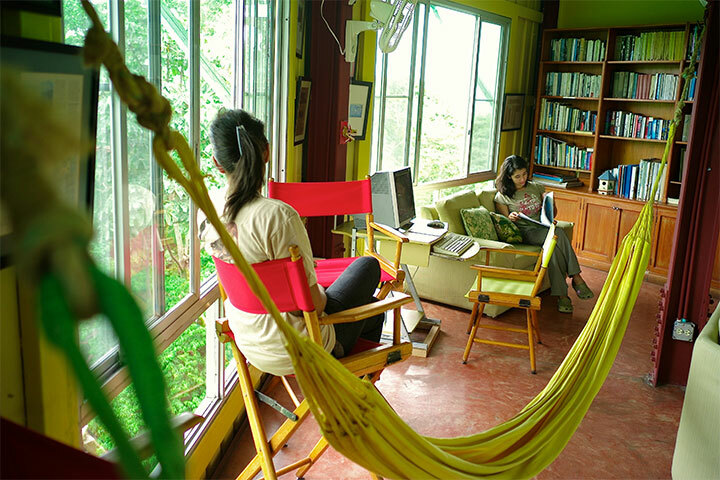 In the morning, ardent bird watchers and nature lovers assemble here for coffee and crackers while enjoying the abundant action in the treetops just below. This a bird watching experience unlike anything else. “When I was building the Canopy Tower there were moments of doubts about the eventual success of the enterprise, when those moments appeared I’d go up to the Observation Deck and feel the wind, hear the howlers, see the birds and my fears would vanish”. 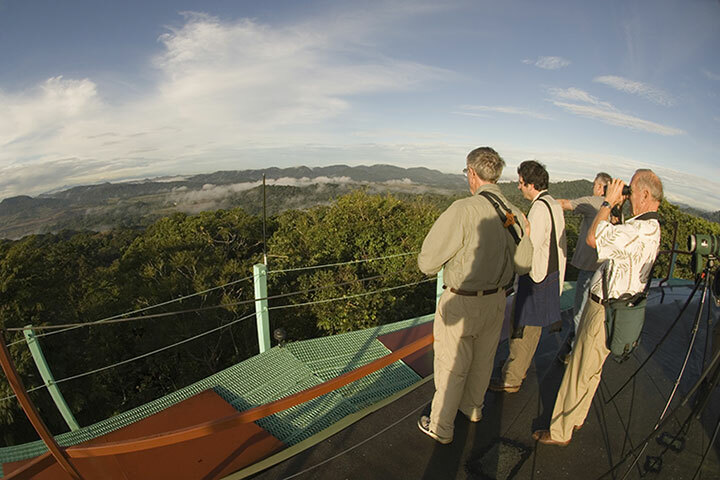 The Canopy Tower is located in the heart of Soberania National Park, and virtually surrounded by the best birding spots in Central America. 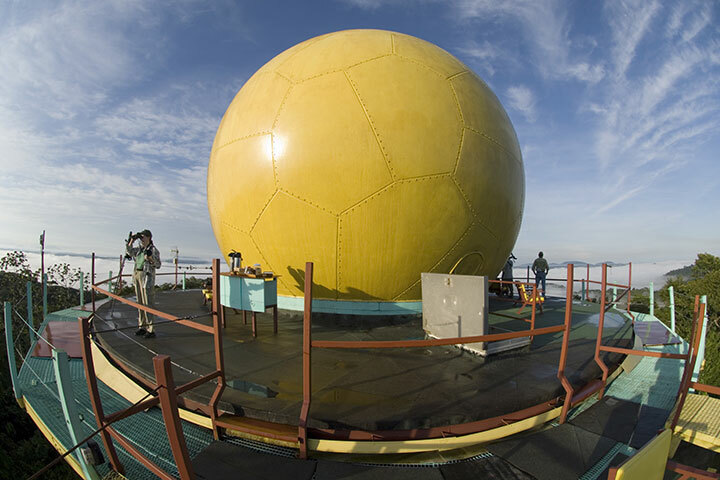 Most of these hotspots are a mere 15-minute drive from the Tower. 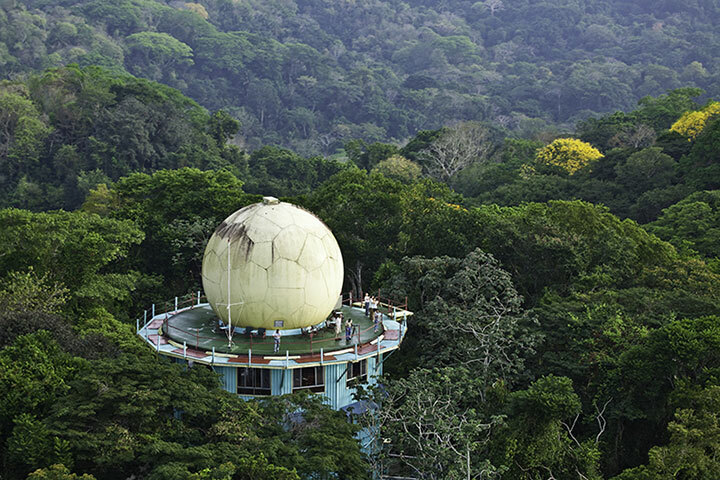 The Canopy Tower is located on the Caribbean Slope, but very close to the continental divide. Therefore, it is a great place from which to get a good sense of the differences in habitat between the dry Pacific Slope and the wet Caribbean Slope, without having to go very far thanks to Panama’s unique geography. To get to these birding areas nearby, we take you in our specialized birdmobiles! 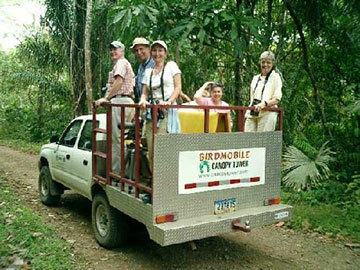 Over the years, we have had a few different birdmobiles and rainfomobiles, some of which have carried the names “Shrike-Vireo” and “El Tinamu” – modified trucks with open-back seating for our guests to enjoy the birds along the way to and from the birding sites. 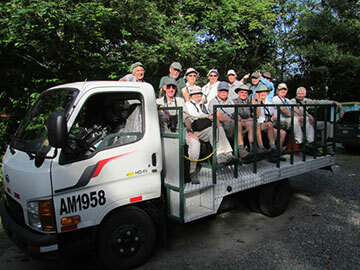 From 4×4 trucks that seat 6 in the back to the large “Tinamu II” that carries groups up to 16 birders! The “Shrike-Vireo” birdmobile was a 4×4 Toyota pick-up truck, perfect for day trips far into the rugged terrain of Pipeline Road. 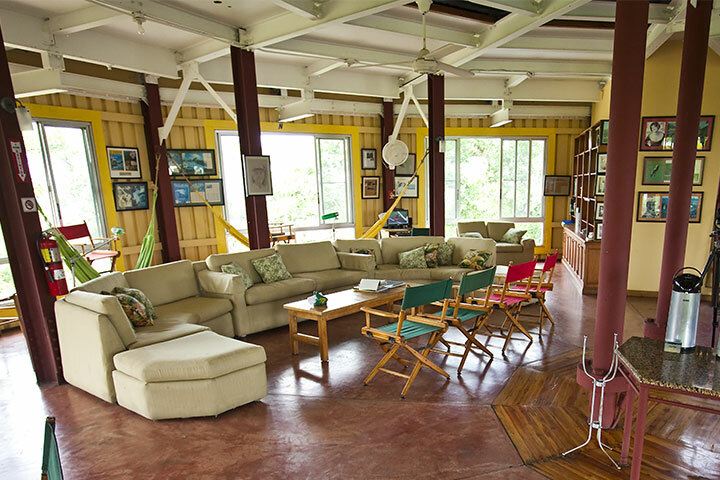 The birder in the upper left-hand corner is Robert Ridgely, famous ornithologist and author of A Guide to the Birds of Panama, The Birds of Ecuador and The Birds of South America. 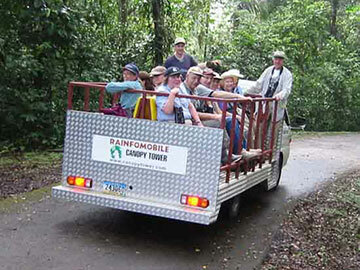 The rainfomobile, “El Tinamu” was capable of carrying up to 14 birders, and was used during tours close to the Canopy Tower. If you look closer you will recognize the famous birder, conservationist and good friend Victor Emanuel in the upper right-hand corner. What is there to do at night at the Canopy Tower? After dark, in addition to keeping an eye out the windows for owls and nocturnal mammals, there is plenty of time to relax in one of our hammocks, chairs or sofas to enjoy a book or magazine from our library about birds, butterflies, mammals, natural history and selection of best sellers and novels. Our guests also take the time to review their daily sightings and plan the next day’s tours with the guides. There is WiFi available and an iMac for guest use. Some nights, a night tour may be scheduled after dinner.